Thyme is a small, perennial, evergreen shrub with tiny grey-green leaves and small purple flowers. A member of the mint family, the thyme plant grows well in hot, sunny climates with well-drained soil, and tolerates droughts and deep freezes. Thyme’s name derives from the Greek root for “spirit” and “smoke” because the ancient Greeks used thyme in their burnt sacrifices. Thyme also served as a symbol of bravery. It was often carried in the scarves of medieval knights. The essential oils of thyme contain up to 54% thymol, a natural phenol, which is very aromatic. Some thyme varieties have hints of oregano because they also contain carvacrol which is the essential oil of oregano. In addition to its pleasant aroma and distinct flavor, thymol is a biocide, with antiseptic and medicinal properties. There are over 65 varieties of thyme. These include common (French) thyme as well as flavored thymes (orange, lemon). A popular herb used to flavor savory meat and vegetable dishes, especially in French, Italian, Mediterranean, and Levantine cuisine, thyme goes particularly well with scrambled eggs, tomatoes, and lamb. When dried, it is a component of bouquet garni, herbes de Provence, and za'atar condiment. A sprig of thyme is a single stem snipped from the plant. Leaves are easily removed by pulling through the fingers or through the tines of a fork. Two sprigs yields approximately one teaspoon of leaves. 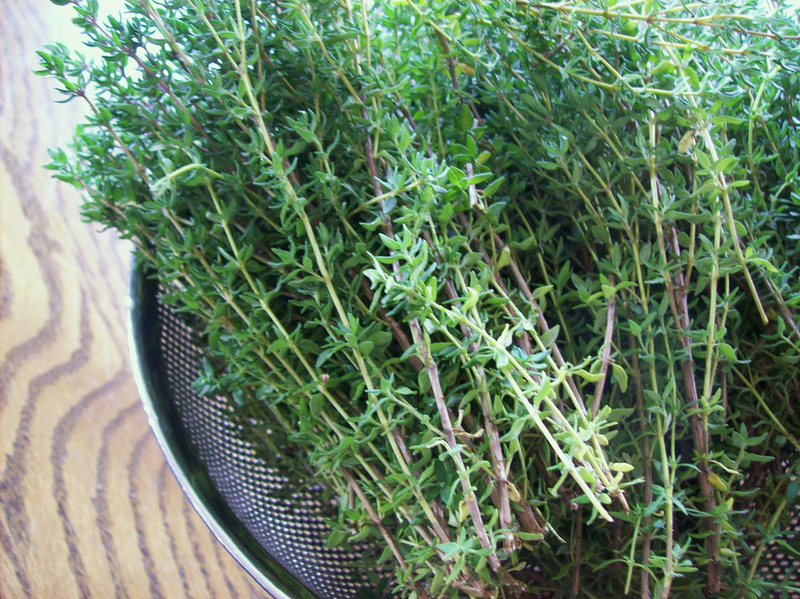 Fresh thyme may be stored in a plastic bag in the refrigerator. Thyme is rich in anrtiangiogenic phenol content, including apigenin, luteolin, eriodictyol, rosmarinic acid and quercetin. Luteolin is the primary phenolic compound in thyme that confers anti-angiogenic and anti-cancer properties. In an epidemiological study including over 66,000 women, women in the highest quintile of luteolin consumption were found to have a 34% decrease in ovarian cancer incidence compared to those in the lowest quintile. In laboratory studies, luteolin inhibited human ovarian cancer cell proliferation and decreased the expression of the angiogenic growth factor, VEGF. Other studies suggest this VEGF-inhibiting activity is dependent on the particular aromatic ring structure of luteolin and other similar phenolic compounds. In both skin cancer cells and mouse models, luteolin inhibited ultraviolet radiation-induced skin cancers. Thyme and other herbs can be used to preserve the nutrient levels and shelf life of food. In a USDA study, thymol, the essential oil in thyme, sustained the shelf life and food quality (sugar, phenol, and flavonoid levels) of fresh strawberries. Thymol in thyme oil is the active ingredient in Listerine mouthwash, and has been shown to reduce dental plaque and gingivitis. The ancient Egyptians used extracts of thyme (containing thymol) and oregano (containing carvacrol) for their bactericidal and fungicidal properties to preserve mummies.